They have returned! No more peaceful coexistence. No more sitting back and thinking that we have some kind of truce worked out. How could I have trusted them? How could they have betrayed me like that? I must gird my loins, whatever that means, arm myself for battle. Bring out the plastic spoons and the bottles of Shake-Away repellent. … and they have eaten to nubs my entire second planting of green beans! Just look at that picture. Well, don’t look too closely because there is some crabgrass there, and that squash in the corner looks half dead because, well, it is half-dead. It’s been kind of hot around here lately and we haven’t gotten a lot of rain in the past few weeks so the garden looks hot and dry, because it is hot and dry. 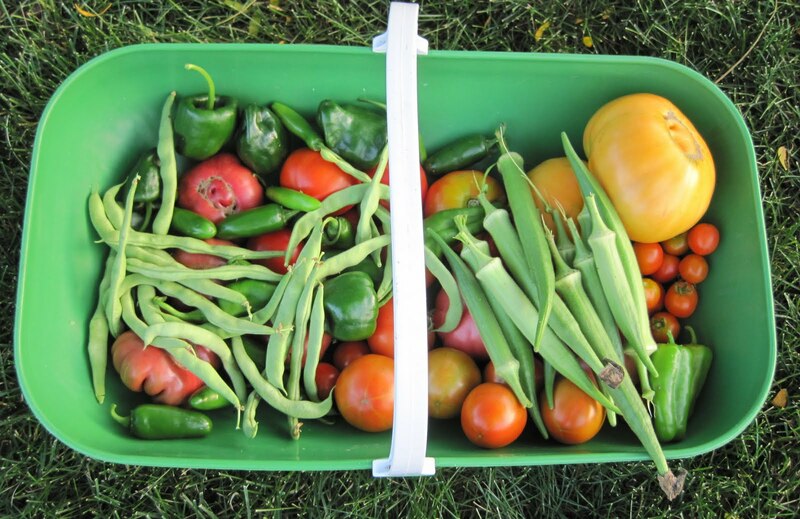 But I’m still picking tomatoes, peppers, a few pole beans, and some okra. The okra is really growing well in this heat, though at the end of the day, even those plants look like they could use a good soaking. 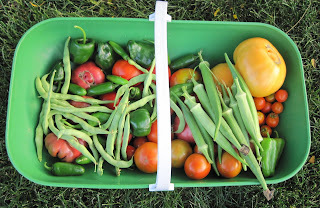 With a harvest like that, I know that now is not the time to give up on the garden and I won’t just yet. I’ll clean it up, pull out the plants that are no longer producing, weed the raised beds, water it well, and see what I can plant for a fall harvest. Maybe some spinach and late season lettuce? Maybe even try to sneak in a late planting of green beans? We’ll see. That should keep me busy until cooler weather in September when the garden designer returns with some of the shrubs and other plants planned for the newly dug borders in the backyard. I’ll have to post a separate update on that, as there is a lot to tell, and this letter post is getting a bit long winded. Plus I must go now and strategize on how to take back the garden from the rabbits, once again. P.S. For those gardening friends who are interested, I’m giving away a copy of “Monet’s Passion: Ideas, Inspiration & Insights from the Painter’s Gardens by Elizabeth Murray. Deadline to enter by leaving a comment on yesterday’s post is Tuesday, August 10, 2010, 9:00 pm EDT. I am very lucky, no rabbit in my garden. Good luck with the beastly bunnies, Carol! You're still getting some very nice harvests. Didn't I tell you not to trust them? That the only good rabbit is a chocolate one? I should send you my BunnyFence to protect your beans. Ah, now I know what crabgrass is! My guinea pigs love it. I'm surprised the rabbits didn't eat it. Best of luck from the land of the Rabbit-Proof Fence! I had a few plants that rabbits got to every year. 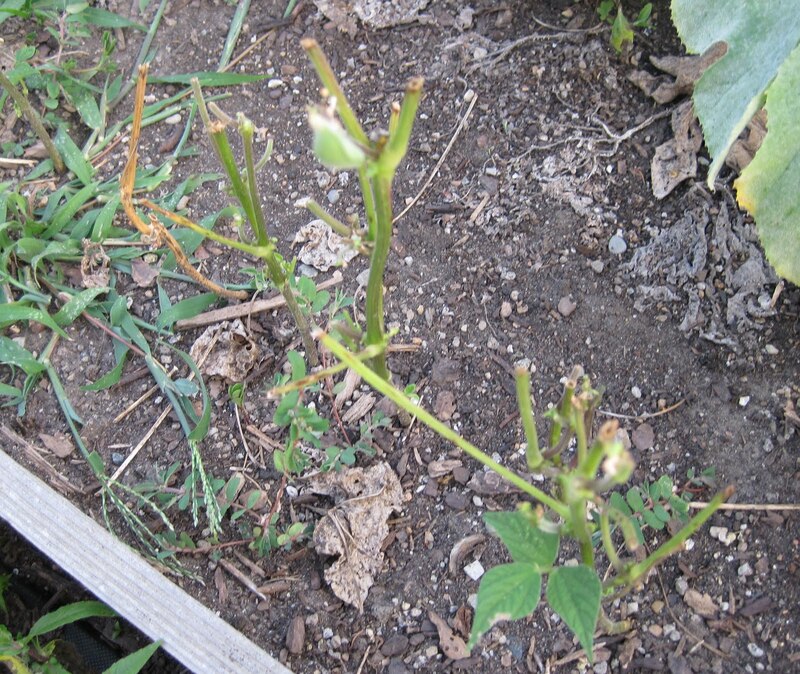 Nice swelling buds one day and stalks the next. I think I've tried everything, and the only thing I've found that works is to take thin bamboo stakes, and cutting them off at 45 degree angles, maybe 12" long. Plunk that in the ground pointy side up and let your plants grow around it. I think the pokes they get when foraging may be a deterrent. If it's just a coincidence, it's a happy coincidence.